​We live in a society that revolves around consumption. We buy something, it breaks, we throw it out and buy a new one. This is the norm, but there are serious consequences with this cycle of obsolescence. The average American produces 4.4 pounds of trash per day most of which is sent to a landfill. But what if we could change this? You can start with recycling and composting. But you can take it further. Repair reduces waste, reduces the need for the extraction and production of raw materials and the energy needed to do so, and promotes community sustainability. 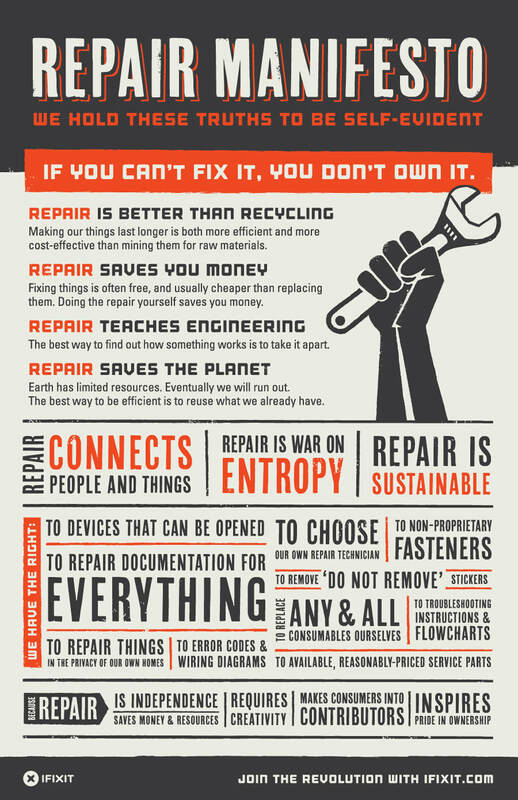 The Open Repair Alliance is a group of organisations committed to working towards a world where electrical and electronic products are more durable and easier to repair. Need help or advice to repair a broken item? Fill out their Broken Item Report to receive help with troubleshooting and share data about broken items.